Upon receiving your new plants, it is important to open the shipping box(es) immediately. Carefully remove all packing materials and containerized plants from the carton(s). Do NOT keep the plants in the shipping boxes as this will reduce plant quality and may lead to plant disease or death. If the potting mix is dry upon arrival, apply water to the containers until the root zone is thoroughly moist. 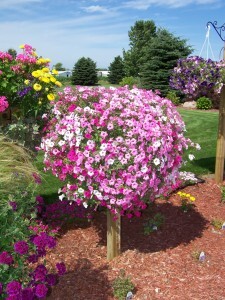 When possible, plant your new perennials within 1-3 days after they have been received. If it is not possible to plant them within this time period, keep them in an area that provides some degree of shelter from the natural elements (sun, wind, rain, etc…) until they can be planted. *Squeeze the pot a few times and while holding the plant hit the bottom to loosen the plant, it should slide right out. *Set the plant in them hole approximately 1 inch above the ground. Replace the loosen soil around the plant, add in water and press the soil down. If the plant is sitting to low in the ground you may need to add additional soil in the bottom of the hole. *You may cover the area around the plant with mulch and you are finished.